Goran Dragic scored 20 points as the Miami Heat beat the Brooklyn Nets 101-89 in the Global Games in Mexico City on Saturday. Tyler Johnson also scored 20 points for the Heat to follow up his season-high 25-point showing in Wednesday's loss at San Antonio. He helped Miami stay close by scoring 18 of his points before halftime. James Johnson added 17 while Justise Winslow contributed a season-high 15 points and hit a career-best four 3-pointers as Miami shot 46.7 percent from the field. Rondae Hollis-Jefferson led the Nets with 18 points and Spencer Dinwiddie contributed 15 and nine assists but it was not enough as Brooklyn dropped its sixth straight game against Miami and appeared fatigued by Mexico City's over 7,000-foot altitude. Lou Williams scored 35 points, including a long three-pointer with just over a second remaining, as Los Angeles ended a three-game losing streak with a victory over Washington. 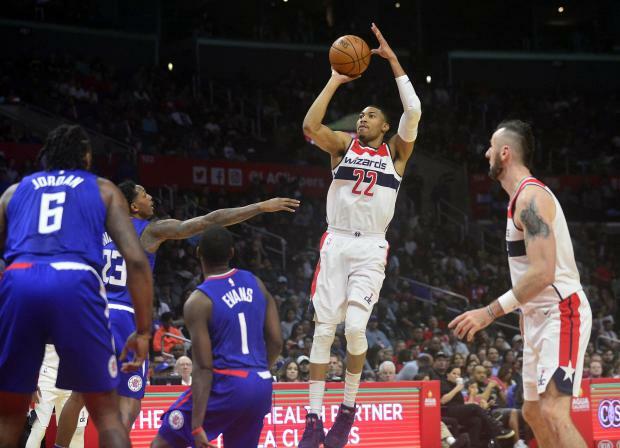 Otto Porter Jr scored 27 points and Bradley Beal scored 25, but that total did not count what appeared to be Bradley Beal's game-winner as time expired. The game ended in controversial fashion as Beal looked as if he scored the winning basket on a baseline jump shot, but it came just after the buzzer sounded. Referees ruled the clock started too soon and replayed the Wizards' final possession. James Harden scored 48 points as Houston rallied from a 14-point deficit after three quarters for a victory over Portland. Chris Paul added 26 points and seven assists for the Rockets, who extended their win streak to nine games and have won 15 of their last 16 outings. Damian Lillard scored 35 points and CJ McCollum had 28 for the Trail Blazers, who lost four the fourth straight game -- all at home. Jordan Clarkson scored 22 points, including 14 in the fourth quarter, and Los Angeles won its second straight to open a four-game road trip with a victory over Charlotte. The Lakers took charge midway through the fourth quarter of a game that had 19 lead changes and nine ties. They led by as many as 15 in the last five minutes. The Lakers opened the trip with a win at Philadelphia on Thursday. Brandon Ingram added 18 points for the Lakers as part of a balanced attack. The Lakers also got 15 points from Kentavious Caldwell-Pope, 13 points from Brook Lopez, 12 points and 14 rebounds from Kyle Kuzma and 12 points from Julius Randle. Kent Bazemore had two steals and slams and two free throws in the final 30 seconds to help the Atlanta secure a win over Orlando. Bazemore finished with 19 points, 17 of them in the second half, as Atlanta avenged Wednesday's overtime loss to Orlando and snap a two-game losing streak. Orlando has dropped two straight. Atlanta was led by Ersan Ilyasova, who was 9-for-9 from the field and scored a season-high 26 points. LeBron James scored or assisted on the Cavaliers' final 22 points en route to another triple-double in Cleveland's win. James finished with 30 points, 13 rebounds and 13 assists in 39 minutes for his 58th career triple-double during the regular season and third this year. Jeff Green, Kyle Korver, and Dwyane Wade all scored 13 points off Cleveland's bench. Jae Crowder scored 12 points, including a dagger three-pointer from James with 40.9 seconds left for a 104-98 lead. Nikola Mirotic scored 19 points and Kris Dunn scored 17, including a pair of free throws with 2.9 seconds remaining, as Chicago beat New York. Lauri Markkanen and David Nwaba each scored 15 points for Chicago, which also got 11 points from Robin Lopez and 10 from Bobby Portis. Kristaps Porzingis led New York with 23 points to go along with 14 from Courtney Lee. Giannis Antetokounmpo flirted with a triple-double, scoring 37 points with 13 rebounds and seven assists in Milwaukee's win over Utah. Antetokounmpo, Eric Bledsoe and Khris Middleton put together another big night offensively, combining for 77 points on 28-of-49 shooting while the Bucks shot 54.3 percent overall. The Jazz set a franchise record for three-pointers when they hit 18 against the Bucks two weeks ago but were 8-for-23 from beyond the arc and shot just 43.4 percent overall. LaMarcus Aldridge scored 20 points and Bryn Forbes hit a three-pointer with 21.5 seconds left as short-handed San Antonio posted a win over Phoenix. Trailing by 19 points in the third quarter, the Suns got back into the game with a 26-9 run and took their first lead of the game at 100-99 on a Marquese Chriss runaway slam with 1:19 left. But after Josh Jackson made one of two free throws to extend the lead to two, Patty Mills found Forbes alone in front of the Spurs bench for his first made three-pointerin six tries to give San Antonio the lead for good. Russell Westbrook completed another triple-double just in time to give Oklahoma City a much-needed road victory in overtime, against free-falling Memphis. Westbrook, who shot 7-of-29 from the field, had the ball in his hands with his team down 101-100 in the final eight seconds. Russell blew by the defense, drew the contact and hit both free throws to give the Thunder the lead. It gave him 20 points, 14 assists and 11 rebounds.